Unfortunately, not many buildings remain of the Moorish period, here on the island of Mallorca, and only scarce remnants can be seen of the former Islamic religious architecture. 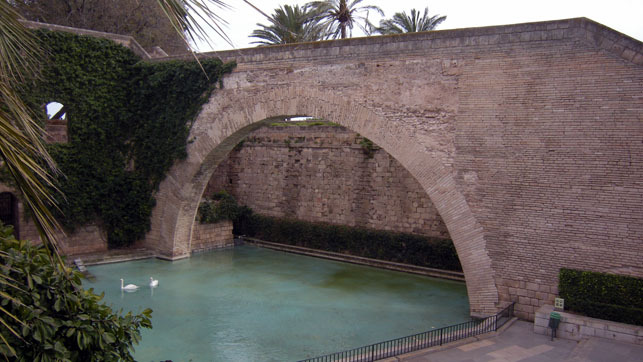 Apart from the Banys Arabs (Arab baths), parts of the Palau de l’Almudaina, parts of the Almudaina de Gumara (the Castillo del Temple), bits of the old Moorish city walls, and the Porta de l’Almudí, there is not much left. Except, there is the Arco de las Atarazanas de la Almudaina (see photos top and centre). The vast arch with a span of 18 m dates from the 10th century; it used to serve as the entrance for the Emir‘s ships to his fortress. 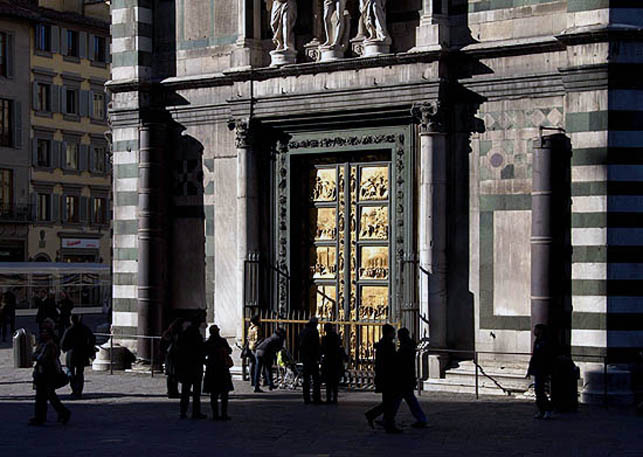 Curiously, two other architectural fragments of the one-time Medina Mayurqa made their way to Florence, Italy, and to the eastern façade of the famous Baptistery of St. John where in 1452 the gilded bronze door of the Baptistery was installed (called ‘the Gate of Paradise’). On either side of the bronze door in Florence you’ll find two beautiful columns of red porphyry that originally formed part of the mezquita (mosque) opposite the Almudaina palace in Palma. Those of you who are interested in more details can read about the destruction of Medina Mayurqa on the excellent Poemas del Río Wang website. There, you can also read why the red columns are now of a deep black colour. 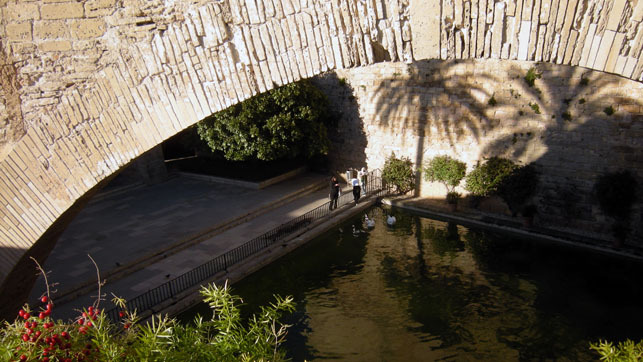 The photos (top and centre) were taken in Palma de Mallorca, Baleares, Spain. The dates: February 3rd, 2011 (top) and March 31st, 2010 (centre). The time was 16:34:21 and 16:28:18, respectively. The photo (bottom) was borrowed from the Internet, courtesy of riowang.blogspot.com. Thank you very much.